The Bronx-based Rose is a Columbia University graduate and received a master’s degree in theater from the Sorbonne in Paris, where she studied for two years. She is an accomplished independent film producer and director (most of her work is for grown-ups), with Creative Block, about a young artist and puppet-maker, having won awards at the Mindfield Film Fest in Los Angeles and at the Spotlight Short Film Awards in Atlanta. Puppets were also central to her Web TV series Callie & Izzy. 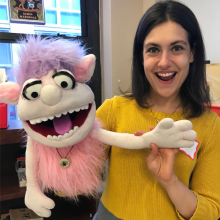 “Puppet Playtime” is sponsored by the White Plains Library Foundation. Yes, this event will be at 7:00 p.m. as we regularly have a program on Wednesday evenings geared towards families, and there are usually younger children present.